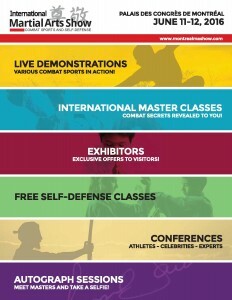 The International Martial Arts Show is a long awaited gathering event for combat sports practitioners and martial artists! Official schedule of the International Martial Arts Show will be revealed online in May 2016. Come attend Caroline Veyre’s press conference Saturday, June 11th at 2pm on the main stage ! She will then participate in a public training session on the Ring of the Internation Martial Arts Show from 2:30-3:30 pm. Come admire all the hard work behind her success. An autograph session will also take place after her training.